When it comes to video games, the Vietnam War is a popular subject. Already in 2004 we've had Vietcong, Conflict Vietnam, and Shellshock, but now there's another from the developer behind Allied Assault, called Men of Valor. Very similar to the aforementioned games, and indeed the Medal of Honour series in general, Men of Valor is a solid war game that pits players in myriad hostile situations that are extremely faithful to the documented events of the conflict itself. Though character development is minimal here, it's clear that developer 2015 has put its collective heart and soul into re-creating a historically accurate simulation as well as a sound shoot-em-up. And this is brilliantly reflected in the nature of game's many missions. As an American Marine, you'll be charged with traversing the usual plethora of jungle-based environments as you foil enemy ambushes and take down deceptively innocent enemy camps. However, despite the open jungle locales, gameplay is remarkably linear, forcing the player to follow a set path for much of the game. Don't be disappointed though, because this helps to make the proceedings straightforward and pleasurable. But that's not to say Men of Valor is too easy, because it isn't. Heavy foliage often makes your foes difficult to spot, and enemy AI is cunning. The ability to inflict casualties with a good assortment of 1960's weapons helps a great deal, but the adventure is never an easy one. 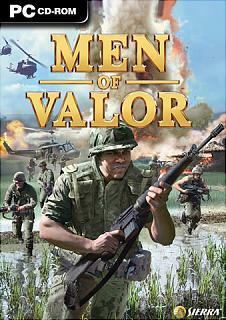 Single-player mode aside, Men of Valor also plays host to an extremely accommodating multiplayer game that has would-be troops the world over competing in any number of well-known online modes. The multiplayer environments also happen to be better suited to online competitions, bringing line-of-sight and stealth very much into the fray. Although those familiar with the Medal of Honour series will feel most at home with Men of Valor, Vivendi's latest Vietnam offering will probably appeal to just about every fan of the genre.